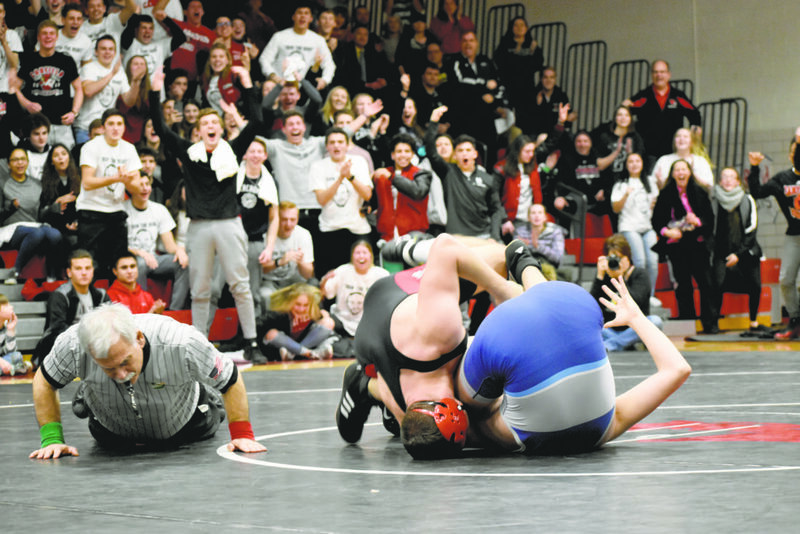 Tribune Chronicle / Joe Simon Canfield’s crowd celebrates as the Cardinals’ David Crawford finishes a pin of Louisville’s Lathan Larsen on Wednesday at Canfield High School. Canfield won the match, 33-31, to advance to the state quarterfinals in Columbus on Feb. 11. Tribune Chronicle / Joe Simon Members of the Canfield wrestling team celebrate after they won the Division II, Region 12 dual team title Wednesday. Tribune Chronicle / Joe Simon Canfield’s McCoy Watkins (foreground) tries to secure a takedown on Louisville’s Logan Vanicek during their match Wednesday in Canfield. 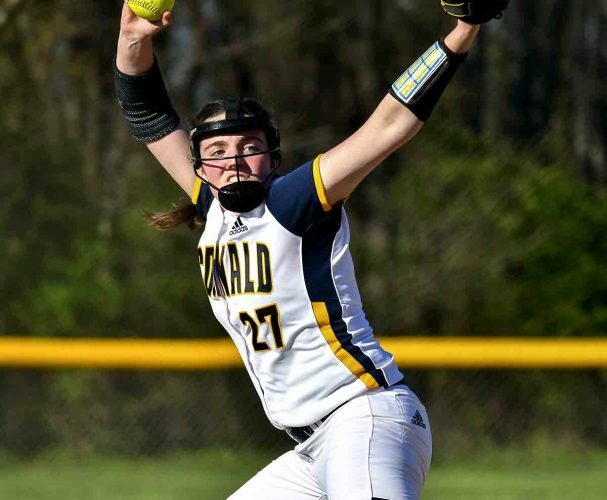 CANFIELD — It took every ounce of restraint that Tyler Stein had to stay composed. Of all the big moments the Canfield High School wrestling program has enjoyed over the last few years — and there have been plenty — this was the biggest one yet. And while Stein was the one who put the Cardinals over the top, he didn’t want to disgrace the moment by celebrating on the mat. 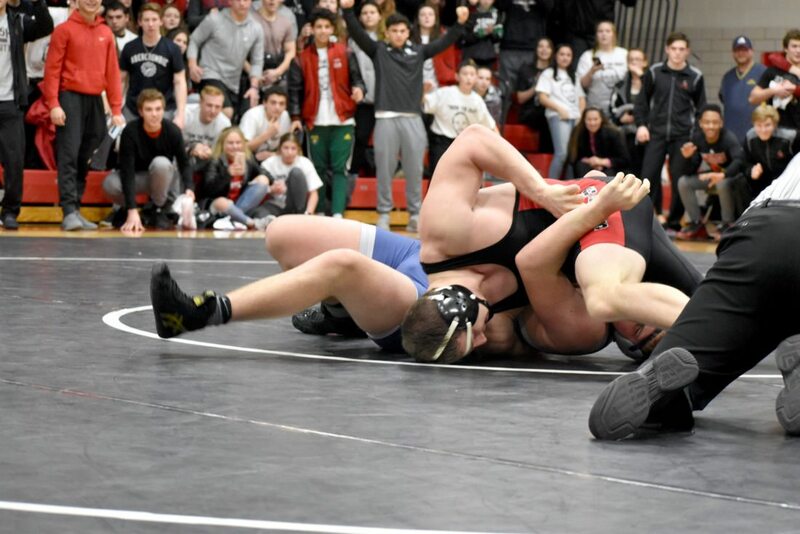 Stein’s pin at 220 pounds set off a wild celebration in a packed Canfield High School as he was the deciding match in the Cardinals’ 33-31 victory over Louisville in the Division II Region 12 championship of the OHSAA Dual Team State Tournament. 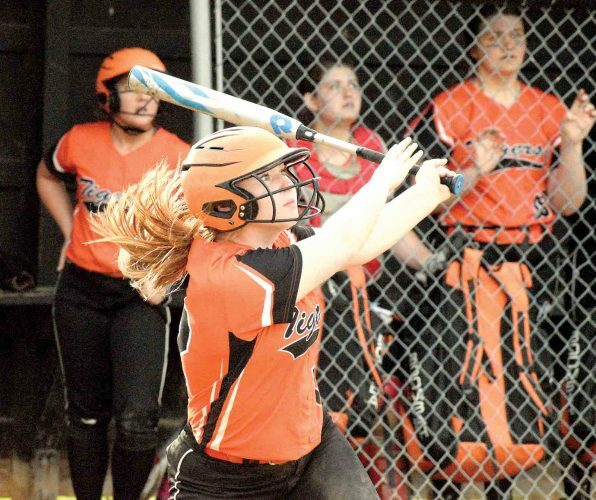 Canfield had good reason to celebrate, too, because this one was a long time coming. The Cardinals, now 18-0, lost in the regional final twice (2015, 2017) and both came in heartbreaking fashion — once on the final match and the other on a controversial illegal slam. There was no controversy this time. 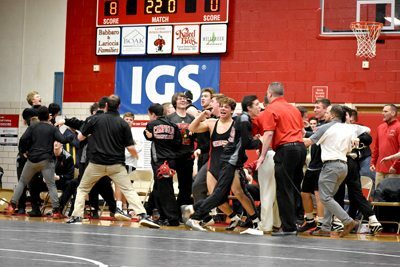 Canfield, which now wrestles in the state quarterfinals at St. John’s Arena in Columbus, won five of the last six matches to rally from a 25-6 deficit and pull off a monumental win. 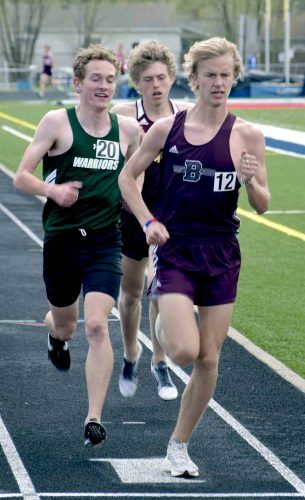 The Cardinals have been state runners-up at the individual state tournament the last two years and crowned two state champions in Georgio Poullas (2016) and David Crawford (2017), but the fact that everyone on the team played a part in this victory made it sweeter to Canfield. Louisville, the No. 2 seed in the top half of the region, upset top-seeded Beaver Local, 42-24, earlier in the night, while Canfield handled West Branch, 49-22. That set up a dual between two teams loaded with state-ranked wrestlers (all four also are part of the Eastern Ohio Wrestling League). The Leopards dominated the lower weights, winning five of the the first six weight classes to go ahead, 19-3. However, they only secured two pins in the process. 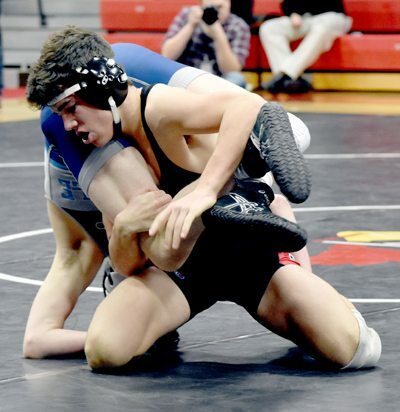 The Cardinals, whose final five wrestlers are each ranked in the top 10 in the state, locked up four pins, a 12-point difference that swung the match. They don’t know what’s next though. Pitts said the Cardinals must wait for the OHSAA to reseed the final eight teams before they know who they wrestle on Feb. 11. The other seven teams remaining are Wauseon, Akron St. Vincent-St. Mary, Lake Catholic, Claymont, Fairfield Union, Ross and Miami Trace. 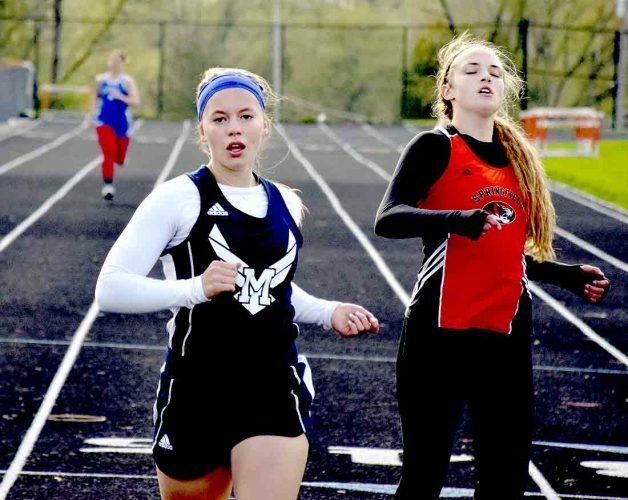 Before they even get to that point, Canfield must refocus for the EOWL Tournament, which takes place Friday and Saturday in Austintown. The Cardinals have won two of the last three league titles. For now, Pitts — and all of Canfield — is going to savor the moment.